The area this route traverses is known as Zhetisu, “the land of seven rivers.” In Kazakh and Kyrgyz, seven is synonymous to “a lot”, meaning, in other words, that this was a land of plenty: a fertile region of rivers, lakes and verdant pasture. When Kyrgyz call their country “the Switzerland of Central Asia”, Zhetisu is what they are talking about. Surrounded by endless hungry steppe to the north and snowy peaks to the south, it was an oasis for the Kazakhs and Kyrgyz who came from the harsh environment of Inner Mongolia. Before them, the Caucasian Scyths lived here, fearsome warriors who left hoards of gold under burial mounds being discovered to this day. This is a route for the landscape lover. Desert, valley, mountain, forest, lake and steppe are all packed together in the small Zhetisu area. 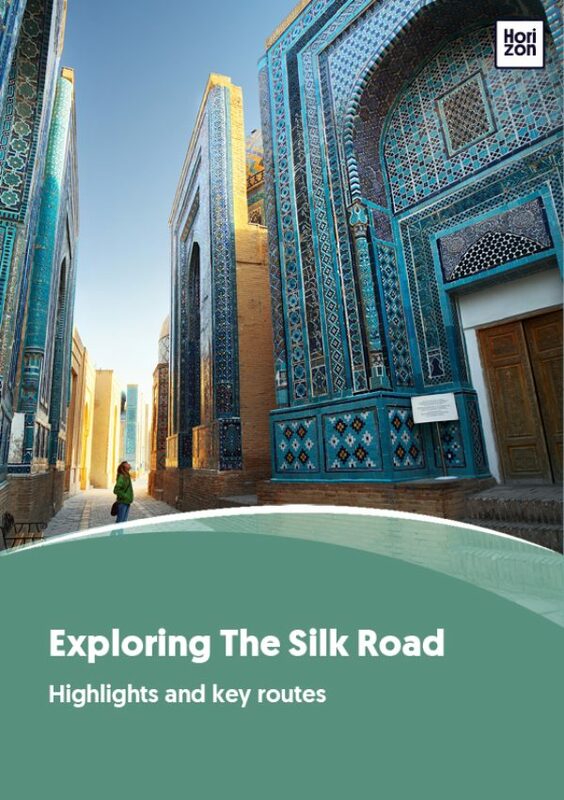 Learn more about the history and culture of Kazakhs and Kyrgyz, while being hosted in small villages in the most beautiful part of their country. This itinerary starts in Almaty and finishes in Bishkek, although you could do it in reverse just as easily. If pressed for time, a shorter version of this loop would leave out Kazakhstan, and start and finish in Bishkek. From Almaty, there are 2 ways to start exploring what tour operators often call “the Golden Ring of Zhetisu”. One route goes east directly, past the wild apple forests of Talgar and the kurgans of Esik, straight to Charyn Canyon and the Kolsai lakes. The other option is to detour north, to the Altyn Emel national park, for a 2- or 3-day wildlife safari in search of ibex and kulan. Other attractions in the park are the Aktau and Katutau mountains and the singing sand dune. Depending on your schedule, you can also visit the Buddhist rock drawings of Tamgaly beforehand, before rejoining the regular circuit at Charyn. Those who skip Altyn Emel have more time to see some of the lesser known canyons that are also a part of the Charyn ecosystem, and jump into the hot springs at nearby Chundzha. The Karkara valley holds the seasonal border crossing between Kazakhstan and Kyrgyzstan, only open between April and October. The local shepherds disregard any political agreement, though, camping on either side of the border as they see fit. Karkara means black crane, and is named after the birds who stop here on their voyage between Siberia and South Africa in June and September. En route, ask your guide to stop over at San Tash, an unsightly mound of stones just inside Kyrgyzstan. It is said that Timur asked each of his soldier to deposit a stone here before leaving on a campaign, and taking one back on their return. The dead thus built a monument to themselves, and Timur could count his losses. Karakol, on the eastern side of Lake Issyk-Kul, is a traveler’s favourite. Just developed enough to provide the infrastructure and comfort tourists need, it still retains its village atmosphere. The Sunday market is the place to be if you need a horse or want to buy a sheep to throw a party. You’re likely to not need any animal, in which case you can just enjoy the ruckus of the animal market with your camera close to hand. Karakol is also a hiker’s hub. Mountaineers wait here to be helicoptered in to the Khan Tengri base camp for their ascent, while everyone else heads to the Altyn Arashan valley. This broad, lush valley holds weeks of hiking in its hinterland. If that sounds boring, there is a plan B: you’ll love watching the horses roam free from one of the open-air hot springs that line the valley. From Karakol, the two shores of Issyk-Kul each present a different face of the lake. The northern shore is where the country’s beach tourism industry has taken hold, but there are also lovely incursions possible into the Tien Shan mountains, and an open-air petroglyph museum along with more kurgans. However, most tour operators will choose the southern shore to get you to Song Kol, and deservedly so. The most beautiful landscapes are here, like the attractive canyon of the Seven (yes, seven) Bulls at Zheti-Oguz and the sandstone Fairytale Valley. Tamga is a cute beach town of Slavs and Tatars that holds a Buddhist rock, as well as the massive military resort that nursed Yuri Gagarin back to health after he came back from space. Twin village Barskoon, on the other hand, is as Kyrgyz as can be: this is the best place to learn how to build a yurt or ride a horse to one of the nearby waterfalls. In the mountains behind lies a controversial Canadian mine, digging gold from glaciers. Look closely at the rivers and you’ll notice flecks of gold washing to the sea. We have talked about Song Kol and the marmot-ridden route from Kochkor elsewhere already. Suffice to repeat it stands as the figurative and literal height of Kyrgyz nomadism. An emerald in a silver setting!, is what the Russian explorer Ivan Mushketov exclaimed when he first saw the Suusamyr valley. Well-put, we’d say: this high (average 2200 m above sea level) steppe plateau is tremendously lush in summer, grazed by at least a million sheep (6 million in Soviet times), but the harsh winters and the mountains’ inflexible embrace make it a tough place to live. High and remote, this is one of the poorest areas of Kyrgyzstan, and one of the least travelled bits. The glamour here is rural. Slowly, your journey winds down now, first along the twists and turns of the M41, then through the messy outskirts of Bishkek to finally arrive in the center of the nation’s capital. You have by now had your fill of local cuisine, we presume. Bishkek has American flair ever since the US army built its base here to supply the Afghan War, so take your chance to indulge in one of over 40 hamburgers at the Burger House. Alternatively, order a pizza at the Obama Bar, and get your picture taken with the one and only. In case your geopolitical tendencies lean East: we are sorry to say The Putin Pub has closed its doors.